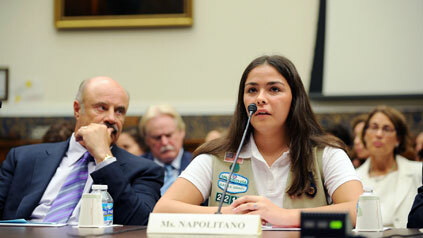 Girl Scout Dominique Napolitano testified before the U.S. House of Representatives Healthy Families and Communities Subcommittee on the issue of cyberbullying on Thursday, June 24, providing legislators a teenager’s perspective on the increasingly widespread practice. Dominique was among a core group of Girl Scouts who helped develop LMK, a leading online safety Web site developed by Girl Scouts in collaboration with Microsoft’s Windows division. The site is unique because it is designed to cover such topics as cyberbullying, online sexual predators and cybersecurity from the perspective of young people. Twenty-three Girl Scouts working with Internet safety expert Parry Aftab have developed the online safety tips and advice for parents and young boys and girls. In addition to Dominique, the panel heard testimony from syndicated talk show host Dr. Phil McGraw, as well as Aftab, who contributed to the LMK Web site, and educators from around the country. Her testimony drew media coverage in newspapers and television stations. A story appears in the Boston Herald, and Dominique’s testimony is available on YouTube. You can also check out photos of Dominique at the hearing at the Wall Street Journal.